So I am curious what are the consequences of running the +9psi map that was made for MT on my CVT for very short periods of time. I just want something for fun rides on the weekends. I would reflash back to the map I run now which is the +6psi map for the injen SRI on my 17 civic hatch. I realize it is not "safe" to run that because of the torque that it will produce is too much for my transmission, but will it blow my engine? Is there a way to make a custom map that is just under what the transmission can handle? I know hondata keeps their maps well within what the engine can handle. I would be ok even trying a +7 or +8psi map. You cannot load a MT calibration onto a CVT, it will not allow you to do this in the software. Are you able to flash your car with the MT tune? Hondata folks: How can we add a little more to our CVT civics and still not approach the limits that would cause damage? I have not tried to load a MT map on my civic. I was asking here because I did not know if it was safe or even possible. I know that the cvt can handle more than +6psi because allows you to, but I didnt know if the Hondata Flash Pro I have would let me. If my understanding is correct, I can find a tuner where I live (phx, AZ) who can specifically make a map that gives me the best hp/TQ that my current setup can handle? Is that right? I had some trouble data logging (not that I would understand much of it anyway as this is my first time dealing with re-tuning an ECU) So that is still on my to do list, but I didnt want to take my car in to get the tune if they couldnt offer me anything that I could not do on my own. Is it worth it for the money to get a custom tune? I am running almost all stock, just have the Injen SRI (have the full CAI but love the sound of the SRI). I will be getting an exhaust as soon as a manufacturer makes one that sounds decent. I feel the need to specify that I do not want to run the +9psi setup all the time. Just would like to have a little fun here and there. The +6psi map is much more fun to drive (especially with the intake) but would like to have the option of more power just for fun short rides. I would also like to know this. How can we add a little more past the +6psi. We're going to allow the torque limit tables to be edited. What seems to be the worst thing for the transmission is power braking. above is what I run for 24psi but if you don't know what you are doing. I highly recommend you take it to a tuner. I will try your recommendation(tq. limit tables and raise boost tables) and closely monitor knock control. Do I need to change fuelling as well? Or the +6psi fuel settings were all good for say a 24psi(+9psi) tune. Im confident with our local 100RON fuel as I have a 400whp d16y8 turbo running on it w/o issues. From what I understand, #1 concern is CVT torque capacity. Knowing that engine produces peak torque at around 3000-5000rpm, then I should kill power/boost/cvt tq limit on these areas? I read on this forum(link below) that I need to increase the ff. as well to get to +9psi for CVT. 1. TC max boost (IAT) - I understand, He raised it so to not get and Error Code for overboost protection. I think He is running 28psi on his CVT. 2. TC max boost (PA) - ^^same reason as above. 3. Knock Air Limit - Not pretty sure what this does and how it affects the overall tune. Your thoughts on this please, or just by adjusting TQ Limit tables and TC max pressure is enough to get to 24psi efficiently. You will need to adjust the tc maxboost IAT/PA even with 24psi. Some users were hitting overboost limp mode between shifts. Just add .3 bar to the whole table for both. 1. Is this normal for DI gas engines to see 14.7 at high loads? I undrestand, flashpro needs to see a certain mg/cyl of air flow before switching the Fuel table from lean/cruising to WOT fuel table. 2. 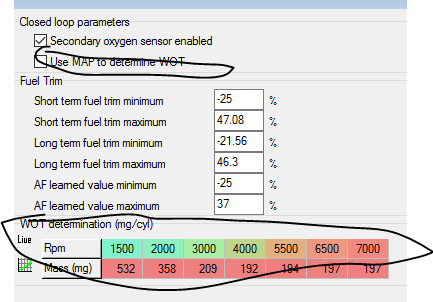 Should I go ahead and adjust the two tables/values below(encircled) so it will quickly switch to WOT rich fuelling table and save my engine from melting??? ***tick use map to determine WOT?? It will sacrifice fuel economy, right??? ***play with WOT determination table?? I've attached my datalogs for your review.